These classic, groundbreaking and genre-defining stories from the early 70's completely changed the mold of mainstream comics and were instrumental in finally destroying the counterproductive influence of the Comics Code Authority once and for all. Brilliant and legendary writer Dennis O'Neil and his equally remarkable artist partner Neal Adams used these two characters as a platform to attack social inequity (racism, poverty) and social ills (drugs, etc.) and created on of the most progressive voices in the industry. The troubles of Roy Harper and his heroin addiction are particularly famous. 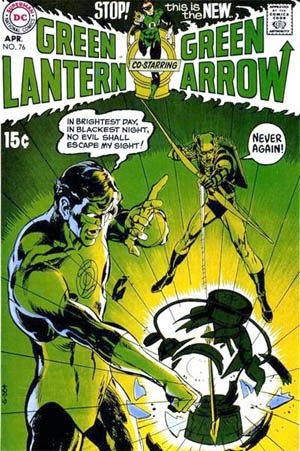 Green Lantern (Hal Jordan) and Green Arrow (Oliver Queen) made a unique mismatched duo, with Hal always looking toward the cosmic and being the consummate lawman while Ollie was the more laid back and liberal of the pair. This ediiton collects Green Lantern v1 #76-87 and 89, and stories from The Flash #217-219 and 226.